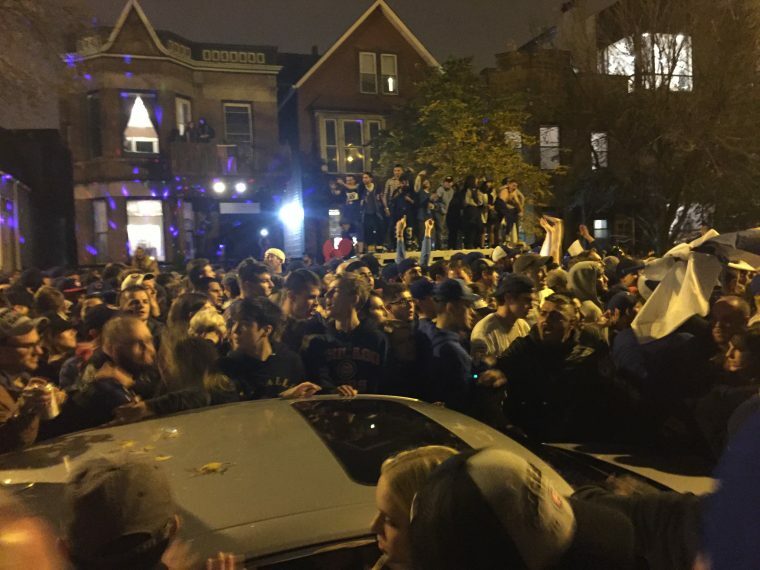 As someone who recently moved from Ohio to Chicago, I was faced with a real moral dilemma last night while I watched Game 7 of the World Series: Should I root for the team from my home state, or should I root to not die in the riot that inevitably breaks out if the Cubs lose? Ultimately, my inherent survival instinct kicked in and compelled me to cheer for the Cubbies, and boy did that decision pay off. Watching the drama unfold in an anonymous Roscoe Village dive bar, I ended up getting more unsolicited high fives in the final 25 minutes of that game than I had ever received in my previous 25 years of living. But as soon as the game ended, something occurred to me—some cars are about to get tipped. Hell, a lot of cars are about to get tipped. I felt that I would be remiss in my duties as an automotive journalist if there were cars near me getting tipped, and I was not there to document their tipping. So I turned to my friend Matt (a morose Cleveland Indians fan busy drowning his sorrows in the eighth PBR of the evening) and suggested we go check out the scene up at Wrigley. 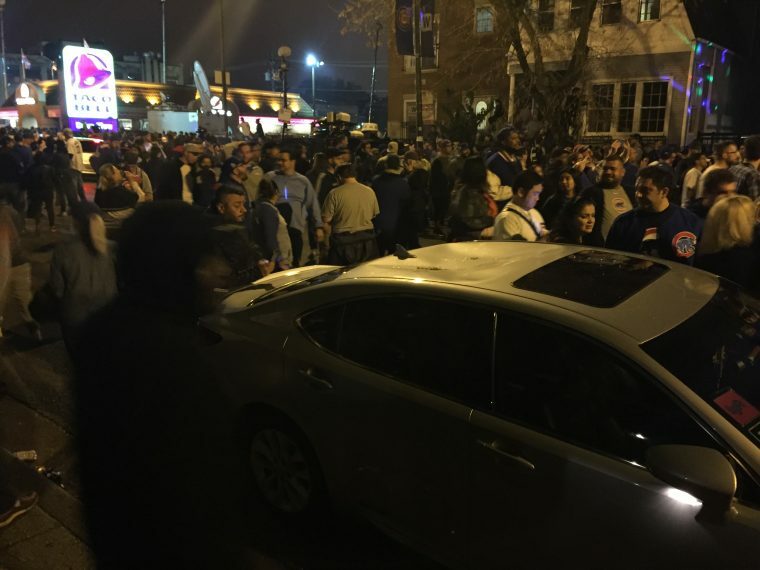 We were roughly 1.5 miles away from the stadium—or, to use some more uncommon units of measure, we were roughly two fire trucks, 8 bars blasting “Go Cubs Go,” 16 honking cars, and 675,423 screaming Cubs fans away from the stadium. So we started walking. 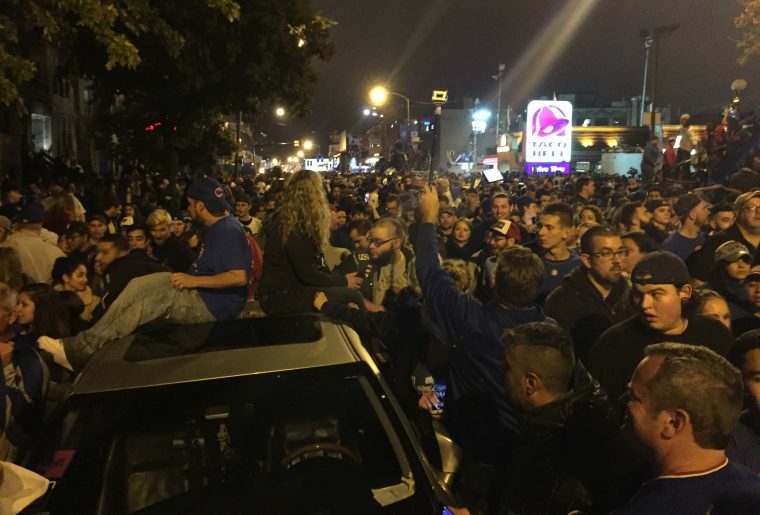 There were fans celebrating as we headed east on Roscoe Street, there were people spilling off of the sidewalk and into the street as we turned left on Southport, and by the time we got to Addison, we were smack dab in the middle of a full-blown mob. As Matt and I pushed our way through the crowd like salmon swimming upstream, I suddenly saw what I was looking for: a car that was about to get tipped. Some poor, poor, stupid person had chosen to park his or her car (which had Uber and Lyft stickers prominently displayed in the windshield) on Addison Street, just two blocks west of Wrigley Field. And the crowd of people that had formed there was not having it. 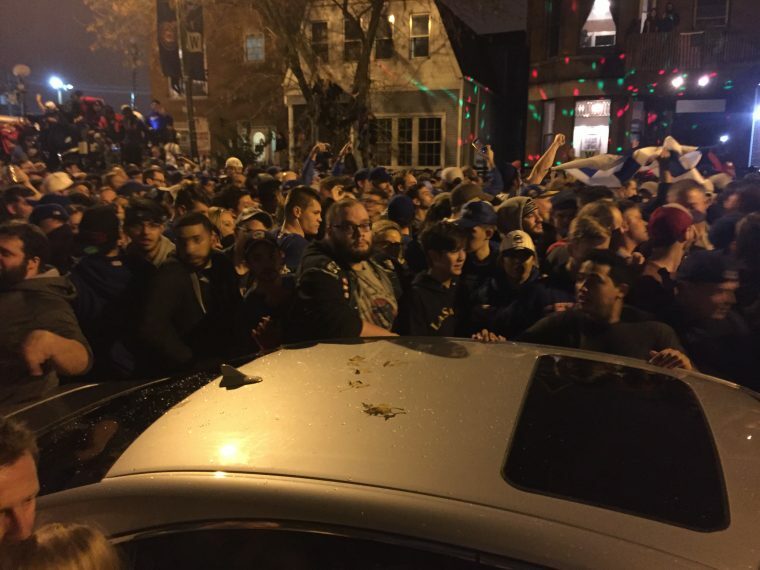 Several Cubs fans began pushing the car, apparently in the hopes of flipping it onto the sidewalk. But when the car proved too heavy (and the sidewalk too crowded) for that to work, they decided instead to just start pounding the roof of the automobile with their hands. Soon, a woman decided to make good use of the car, and crawled up on top of it for a better view of the festivities. Another Cubs fan quickly followed suit. 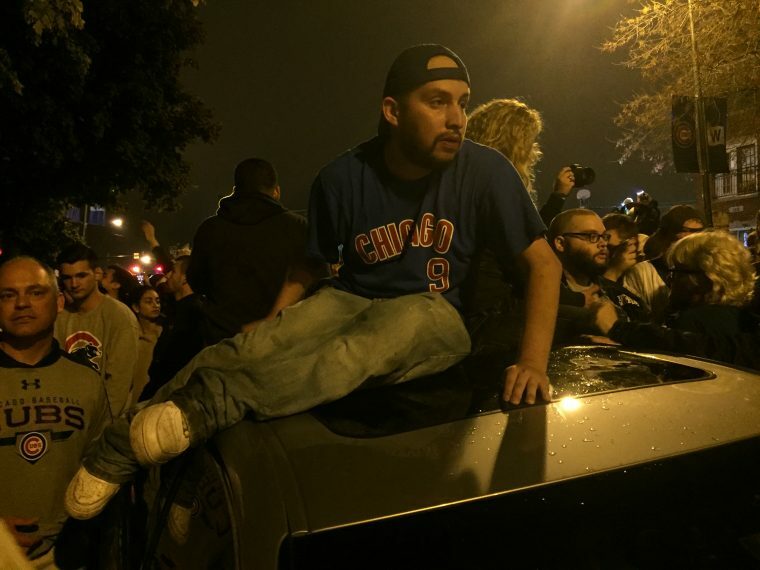 Then, perhaps emboldened by the eight men standing on top of a local news van parked on the other side of the street, he stood up and shouted some generic pro-Cubs rhetoric to the assembled crowd. At this point, I turned around to make sure that my friend Matt was still standing next to me. He was not! Somewhere between ten and a bajillion people had inserted themselves between us. Still, he was within view and made eye contact with me, so I turned back around to snap a few more photos, confident that we would be able to reunite after I was done with my impromptu foray into photojournalism. 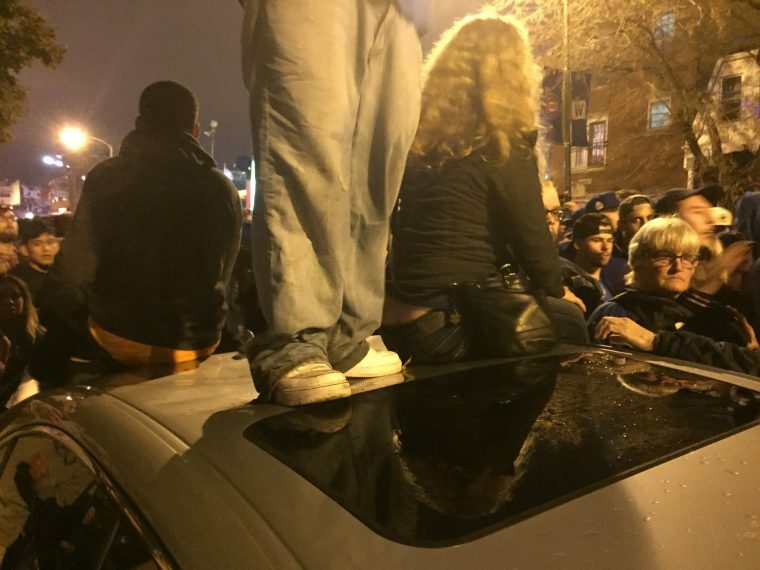 Eventually, the people sitting on the car climbed off, but the damage had been done. As the crowd seemed to disperse a bit, I turned around again to talk to Matt, but he was nowhere to be found. I tried texting him, but to no avail. He had been swept away by a tide of Cubbies fans, and if I tried to find him, I would likely drown myself. So instead I tried to hang around and see if the car would eventually get tipped… but soon the crowd began to thicken again, and it became impossible to stand my ground. I found myself being pushed closer and closer to Wrigley Field, and once I got there, it wasn’t tipped cars that I saw—it was a very different type of transportation. One that was prophesied long, long ago. 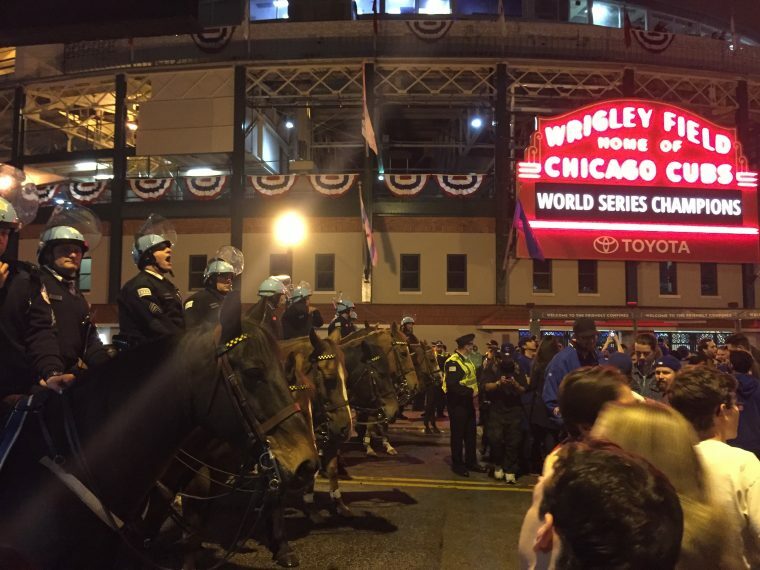 Standing silent sentry outside of Wrigley were all four horsemen of the apocalypse. That’s right folks, you should make peace with your god, because this is it. Hell has frozen over, the end times are upon us, it’s the end of the world as we know it, and Chicago feels fine. 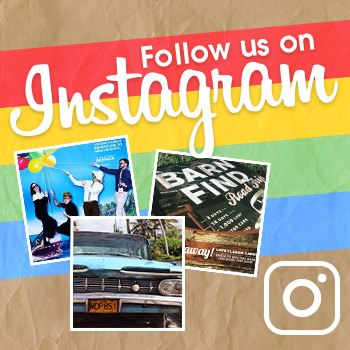 Though it may just as easily bring us a Donald Trump presidency next week, so enjoy these good times while they last.